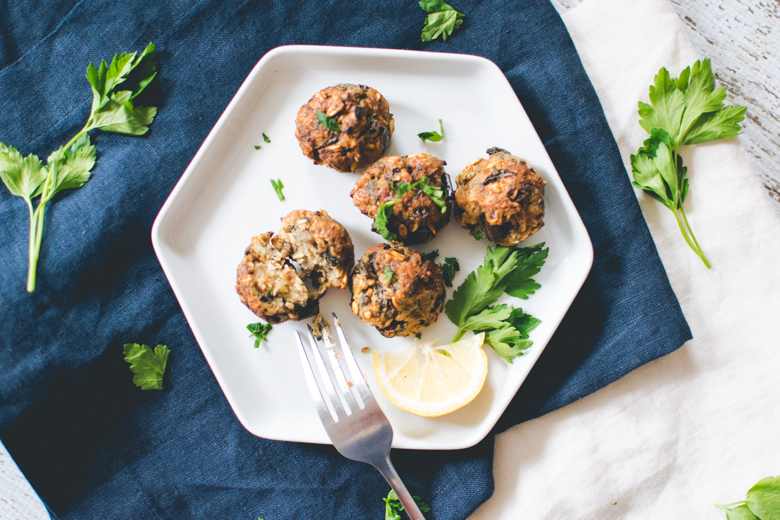 If you’ve recently become a vegetarian or pescetarian & you’ve been craving meatballs, never fear: Meatless Meatballs are here! My favorite meatballs before I became a pescetarian were ones my mother would make or the turkey ones from Trader Joe’s. These meatballs are still top-notch & are packed with flavor & umami. The texture is similar, but not exact to meat, but the best part is they hold together pretty well when simmering in marinara! Great party snacks or a main entrée on a plate of spaghetti, surprise your palette & friends with this delightfully vegetarian meatball. Meatless Meatballs. Click for more pictures. 1. In a large frying pan, melt butter on medium high heat. Toss in mushrooms & brown them for about 2-3 minutes. 2. Add onions & sautée until onions become translucent. Add eggplant & continue to sautée until eggplant has browned & softened. Add garlic & mix evenly, slowly stirring in the red wine. Sautée until wine has been completely soaked into the mushroom mixture. 3. Add parsley, oregano, & pepper. Stir until mixed thoroughly. Remove from heat & set aside in a bowl in the freezer to cool down. Do not freeze mixture!! Just allow it to cool down. 4. Once cooled, add oats, bread crumbs, cheese & one egg. Gently mix the egg with the eggplant & mushroom mixture, wetting as much of the mixture as possible. When thoroughly mixed, add the last egg & mix in thoroughly. Place in refrigerator for 4 hours or overnight. 5. Preheat oven to 425º F. With a melon baller or a small spoon, scoop out little dollops of the mixture & roll into a ball. Place meatballs on a parchment paper or foil lined cookie sheet. Bake for 20-25 minutes or until crispy on outside. 6. Remove from heat & serve or toss in marinara sauce for 20 minutes. If you don't have any bread crumbs, make your own! Grab 3 slices of whole wheat bread, toast it well done, & grate it with a cheese grater. Be sure to grate the bread over a large bowl because the crumbs will fly everywhere. You can also toss it in a food processor to speed it along. 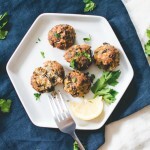 These meatless meatballs are just so perfect for me to make for myself and my vegetarian family. They look SO incredibly flavoursome and delicious! Thalia! Thanks for visiting. 🙂 If you make them, please let me know! I’d love to see your version of them.